In order to make roads safe for driving, and ensuring that no lives are lost due to accidents, The UN Road Safety Collaboration has developed a Global Plan for the Decade of Action for Road Safety 2011-2020. Some of the pillars of this global safety plans include auditing and checking safety measures deployed by automobile companies all over the world. Implementing the standards for car crash tests mentioned by the UN Road Safety Collaboration, a public safety watchdog in UK: Global New Car Assessment Programme (Global NCAP), which is also an independent charity, carried out tests for Indian cars, and the results are alarming: Maruti Swift and Nisan Datsun Go has failed these tests. This implies that these cars are not safe for Indians, and driving these can lead to unforeseen consequences in the event of a heads-on collision. Global NCAP CEO Max Mosley has even written a letter to the Nisan Chairman and CEO Carlos Ghosn, asking to withdraw Datsun Go from the Indian market as soon as possible. In the letter, he has said, “It is disappointing Nissan has authorized the launch of a model so substandard. The Datsun GO will fail to pass the United Nation (UN)’s frontal-impact rule. I will urge Nissan to pull the Datsun GO from India pending an urgent redesign of the car’s body shell,”. The crash tests were carried out as per the UN standards of crash tests devised to gauge the safety level of passenger cars, and to ensure that lives are not lost in the event of an accident. Maruti Swift, which is considered as one of the most popular mid-range hatchback in India has also failed the car crash test. It has received 0 rating for adult protection in an event of accident. In the month of January this year, the same organization had conducted car crash tests for other popular Indian cars such as Suzuki Maruti Alto 800, the Hyundai i10, the Ford Figo, the Volkswagen Polo, and the Tata Nano, and the results were same: Zero protection rating for adults and children. Only Volkswagen took the initiative and implemented some of the security measures as shared by the security watchdog. For example they added an additional airbags in the Polo model for more safety. There is an active campaign currently underway on Twitter: #SaferCarsForIndia, wherein active netizens can pitch in, and propagate road safety measures as declared by the UN, and force the automobile companies in India to enforce the rules. Do you think that these road safety measures for cars devised by the UN and checked by independent safety watchdog is not relevant for Indian conditions and should be ignored? Or the automobile companies are simply refusing to implement them in India, considering how little we think about safety features, compared to price and design? The ratio of Indian deaths in car accidents to its population is the lowest in the world. 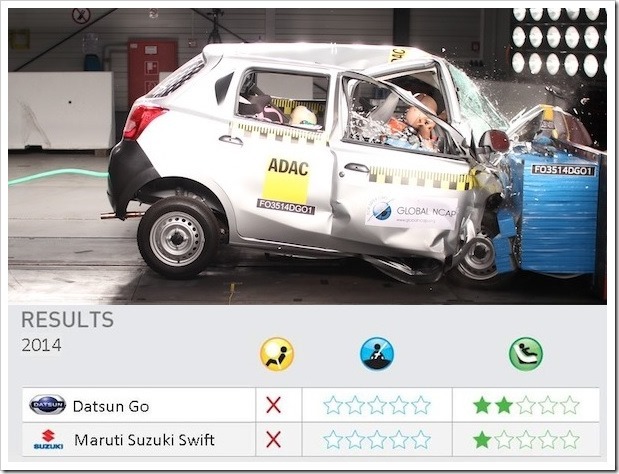 It is interesting, that the Suzuki Swift has 5 stars in the EURO NCAP. So, the Maruti and the Suzuki looks the same but are them completely different cars or the GLOBAL and EURO NCAP tests are different?